Two car bombs went off in the Turkish capital, Ankara, after unidentified terrorists blew themselves up in response to calls by police for them to surrender, local media report. According to Ankara’s governor, Ercan Topaca, security forces launched the operation against the militants on Saturday morning at a farm some 30 kilometers (18 miles) from the capital on a tip-off from Diyarbakir, the main city in mostly-Kurdish southeastern Turkey. He confirmed there were at least two suspects, one of them a female. They were both identified. The third suspect is believed to be on the run, police launched a search operation. Turkish police seized two pieces of plastic explosives and 200 kilograms of ammonium nitrate, a bomb-making ingredient. Police also found an identity card at the scene that is believed to have belonged to one of the assailants. According to the card, he was from the southeastern province of Bingol and authorities believe he had links to the Kurdistan Workers’ Party (PKK). The incident happened on Haymana road on Ankara’s southern outskirts. The assailants were allegedly preparing to carry out a car bomb attack. The governor said it was so far unclear where they planned to strike. He noted that they tried to disguise themselves, hanging Turkish flags on their car, which had been purchased in the past two days. On Thursday, ten people were injured in Istanbul when a motorbike bomb exploded near a police station. The attacker was detained the next day, but his motives are not yet clear. 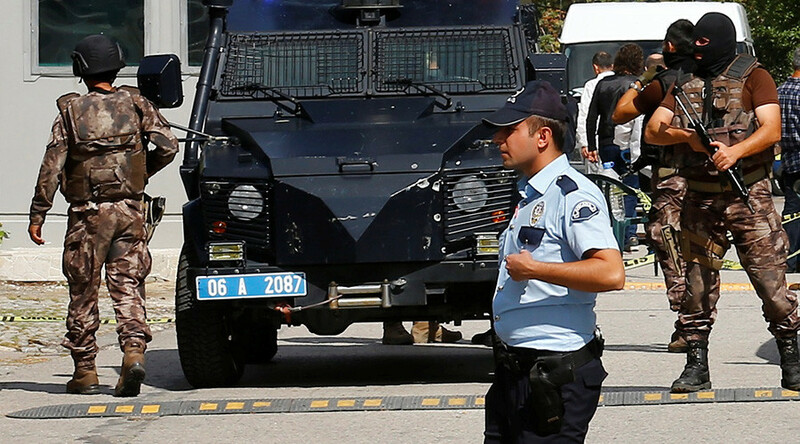 Turkey has witnessed a series of attacks over the past months, with officials putting the blame on either Islamic State (IS, formerly ISIS/ISIL) or the Kurdistan’s Worker’s Party, which it considers a terrorist organization.